Any show buys itself some goodwill when it prominently features the Michael Jackson catalogue. 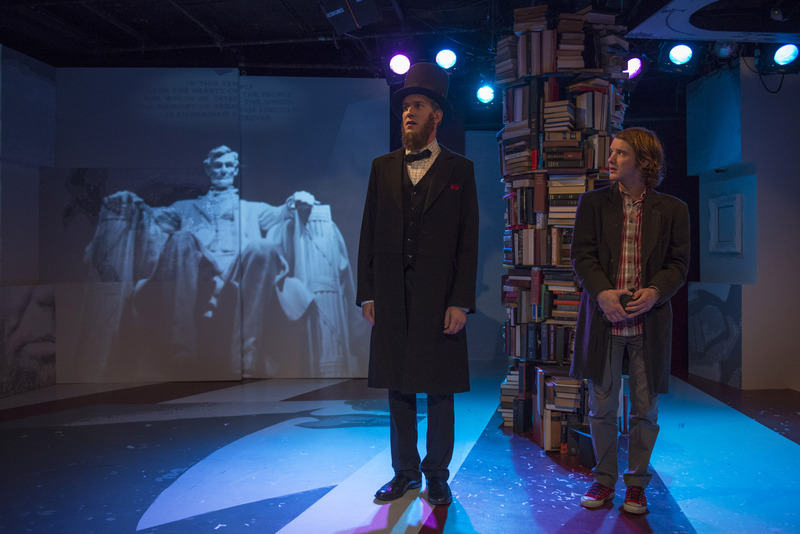 The music of the King of Pop threads its way through Bixby Elliot’s bluntly titled “Abraham Lincoln Was A F*gg*t,” here receiving its Chicago premiere with About Face Theatre. A cappella renditions of Jackson’s songs embody the show’s (mostly) goofy and light-hearted approach, while the disassociation between the man’s music and his personal life—which two characters briefly touch on—points toward the more serious subject at hand. The play, directed by About Face artistic director Andrew Volkoff, opens with a presentation by a seventeen-year-old boy named Cal (Matt Farabee) seeking to prove that Abraham Lincoln was, like him, a gay man. Cal’s relationship with his mother Susan, played by Jessie Fisher, is a strained one, with his homosexuality remaining a taboo subject. This is somewhat owed to the fact that Cal’s uncle Geoffrey (Nathan Hosner) is deeply closeted himself. He’s the kind of guy who thinks that coming to Cal’s birthday and awkwardly trying to pass off his boyfriend (Derrick Trumbly) as his “roommate” is somehow better than acknowledging the truth. The play alternates Cal’s budding romance with his classmate Skylor (Lane Flores) with Cal’s version of Lincoln’s early and later life. Lincoln is played by Hosner and Mary Todd by Fisher. Trumbly plays Lincoln’s, ahem, roommate Joshua Speed. The double-casting creates parallels between Lincoln’s and Geoffrey’s struggle with their sexualities, as well as Susan’s journey to openly accept her son. The high point here is the acting. Volkoff draws quiet, nuanced and detailed performances from everyone at hand—with the welcome exception of actress Dana Black who is delightfully hammy in a coterie of small side roles. Cal and Skylor’s love affair is sweet and touching. Meanwhile, Lincoln’s sadness is heartbreaking. About Face Theatre at Greenhouse Theater Center, 2257 North Lincoln, (773)404-7336, aboutfacetheatre.org, $20-$35. Through July 5.